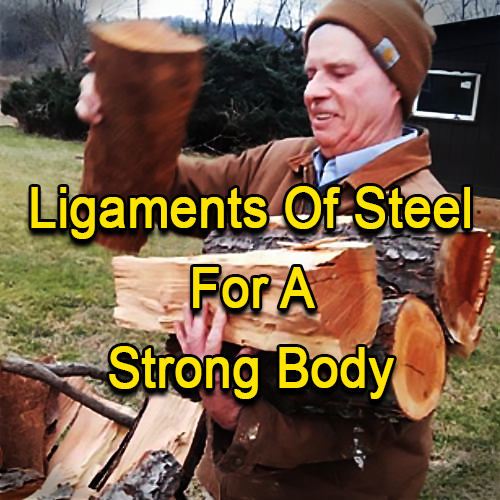 If you want a strong body you must have strong ligaments of steel. These are the powerful elastic bands that tie the ends of your bones together. However, weak ligaments will let the bones shift to where they should not be. Your ligaments hold the ends of the bones together, so the knees and elbows can move as if they were hinged together. Furthermore, they are only held end-to-end by the strong ligaments. Also, nothing else keeps the bones in your feet hands and backbone from sliding around. Without the ligaments your body would fall into a disorganized heap. If your ligaments were removed, your body would virtually fall apart—your shoulder blades would slip from the rib cage, the neck and jaw would become unhinged and your long bones would go willy-nilly like a rag doll. You would not be a happy camper. Strong muscles and weak ligaments and are a recipe for disaster. Ligament strengthening exercises are different from muscle building or strengthening exercises. We will work on simple exercises that can help you to have super-strong feet, ankles, knees, hips, back, neck shoulder, elbow, and wrist and hand ligaments. Keep on mind that you are not trying to strengthen your muscles or tendons—only these cords. You want to have your muscles relaxed at all times. Pretend that you are falling asleep. Only if your muscles are relaxed, will your ligament cords be permitted to function on their own. If you are bed-ridden or chair bound these exercises can be done in whatever position you may be in. This is an old time exercise that will strengthen most of the ligaments in your toes, feet, ankles, knees, hips, backbone, neck and shoulders. Stand relaxed with your hands at your sides and feet at a comfortable distance. Now gently rotate your body as far as is comfortable in one direction. As you rotate, let your torso, shoulders, head and neck move with the swing. Do this Elephant swing a few times and see how it feels. Notice how you move, all the way from your toes, ankles, knees and hips. Now notice that each backbone moves by itself, all the way up to the base of the skull. Notice how the shoulder blades slip along the back of your rib cage. The shoulder blade’s (scapula) only attached to the back of the rib cage by a bunch of ligaments. It allows itself to slide around quit a lot. Now, as you rotate to the end of the swing, allow your opposite heel to rise off the floor. This will further work the ankles and will add a new dimension to the whole exercise. Do this exercise slowly and smoothly for the maximum ligament benefit. As you progress over time, you can increase to whatever speed you like. This is the ultimate ligament building exercise. Stand on one leg and have the other toe on the floor—this toe is only for balance, no weight should be on it. Now do the previous Elephant swing. Be careful and do it near a table or wall so that you can place one finger on something for balance.